By special request: Here is a handy Key to the astrological Glyphs which you can use for reading astrological charts within western astrology. For more information on learning about Astrology in the Western Model. 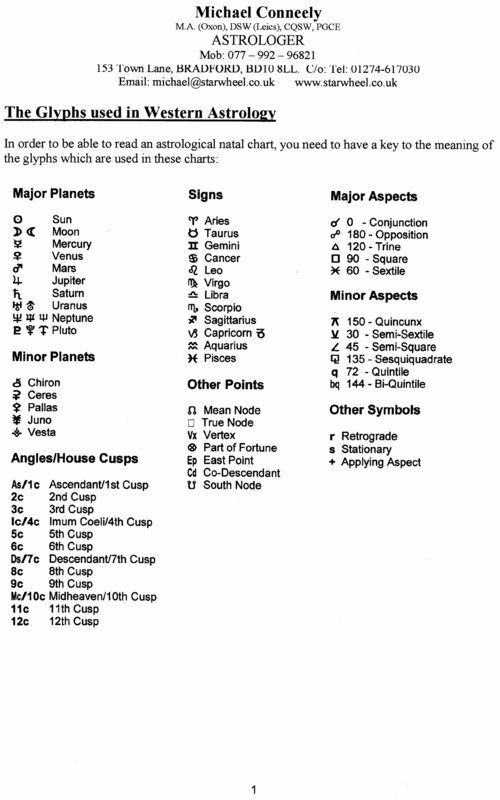 This entry was posted in Astrology Course, Astrology Reading and tagged Aquarius Glyph, Aries Glyph, Aspect Glyphs, Astrological Glyphs, Astrological Symbols, Cancer Glyph, Capricorn Glyph, Chart Angles, Chiron Glyph, conjunction Glyph, Gemini Glyph, House Cusps, Inconjunct Glyph, Jupiter Glyph, Leo Glyph, Libra Glyph, Mars Glyph, Mercury Glyph, Moon Glyph, Neptune Glyph, North Node Glyph, Opposition Glyph, Pisces Glyph, Planetary Glyphs, Pluto Glyph, quincunx Glyph, Sagittarius Glyph, Saturn Glyph, Scorpio Glyph, semisextile glyph, Sextile Glyph, Sign Glyphs, South Node Glyph, Square Glyph, Sun Glyph, Taurus Glyph, Trine Glyph, Tropical Zodiac, Uranus Glyph, Venus Glyph, Virgo Glyph. Bookmark the permalink.